On 1 Monkey/CHUEN we begin again – a new day, a new trecena, and a new season are initiated at the Zero-Point of the Tzolk’in calendar. A Healing that raised Consciousness to our own Truth has prepared us to walk in a new way. The Monkey will be our role model and guide, and can help us see the Inherent Beauty of Living. CHUEN is a magical Day Sign that lives in a World of its own Imagination. Monkey/CHUEN is the Master of all Art that weaves the tapestry of our lives. The Monkey can lead us to a Transformation that redefines the way we See the World. 21 DAYS of CEREMONY: 1 Monkey/CHUEN marks 21 days to the K’iche Maya New Year celebrated on 8 B’atz (8 Monkey/CHUEN). Observing 21 days of prayer and sacred ceremony is a traditional preparation for the observance of the Tzolk’in calendar New Year, which is also the Initiation of the Mayan Daykeepers. CORE DAYS/ZERO POINT: Kins 121-140 represent the 7th Uinal of Balance, the Core Days of the Tzolk’in as observed by Yucatec tradition. Together, Dog/OC and Monkey/CHUEN reside at the Center of our own Universe and vortex of the Up Above, Down Below, and the All Around. Flint’s Truth helped us to recreate Our Self. Now, the Monkey/CHUEN can set the Wheel of Life into a new motion, so we can Recreate our World. PEAK DAYS: The days of Peak Energy reflect a balance of Wisdom and Instinct within own Force of Nature. Our experience in the Natural World is illustrated by the Medicine Wheel. The colors that rotate around its center reflect the elements of our Human Transformation. The Red of the East is the Fire that ignites our Life and Inspiration. The Yellow of the South is the direction of the Relationships that influence. The Blue of the West represents our own Life Experience. And, in the North are the Old Ones, and what we become when our Experience is Transformed into Wisdom. 1 Monkey/CHUEN sits at the Center of the Universe together with its best friend, 13 Dog/OC. Together they are magical as the Partners who Know the Highest Ways of Being and Living. The glyph illustrates Time Rolled Up on Monkey’s Head. Monkey is the Master of all Art who weaves time into a Beautiful Tapestry of our Life. The first half of this Uinal brought the Intention to recreate ourselves through the Sacred Choice of our own “I Am.” Over the last 10 days of the 7th Uinal, Monkey will complete the intention of Balance by Transforming our Experience of Living. The Maya celebrations on this day recognize our Spiritual Guides, and each Kin is acknowledged by a Count of Days, calling the names of each of the 260 Days. This is also a day of the Initiation of those who choose the path of the Mayan Daykeeper. Again on 8 Monkey/CHUEN of our next trecena, Monkey celebrates the Time of our Earthly Experience under Tone 8’s Intention of Divine Justice. Monkey/CHUEN demonstrates a way of living in Playful Curiosity, said to “take ideas as threads of vines and weaves them into the fabric of our reality.” CHUEN can help us approach life in a new way. Approaching life as a game, CHUEN creates life from the Mind of Imagination, leading to innovation, artistic expression, and constructive solutions. CHUEN can help us experience ourselves, holding the Power to Create our own World. As a Time Traveler, Monkey can transform our experiences of both the Future and the Past. The Cherokee Day Sign, Raccoon, is seen as the playful trickster who steals our Heart. After a trecena of taking our Self so Seriously, the Raccoon is capable to force a smile. By learning to play in the experience of the moment, the Raccoon calls on the Magic of our Imagination. We can find ourselves driven by Passion and Personal Interest to the thing we Love, instead of seeing our Lives as a struggle for survival. Like Dog/OC, Monkey guides us to explore life with a sense of adventure and fun. As an Artist, CHUEN can inspire our artful creativity. Art represents that medium through which we are able to directly channel the expressions of our Spirit. As Monkey/CHUEN guides us through this trecena, we will be led to be the Dreamers and Artists who paint our Vision on the Fabric of our Lives. 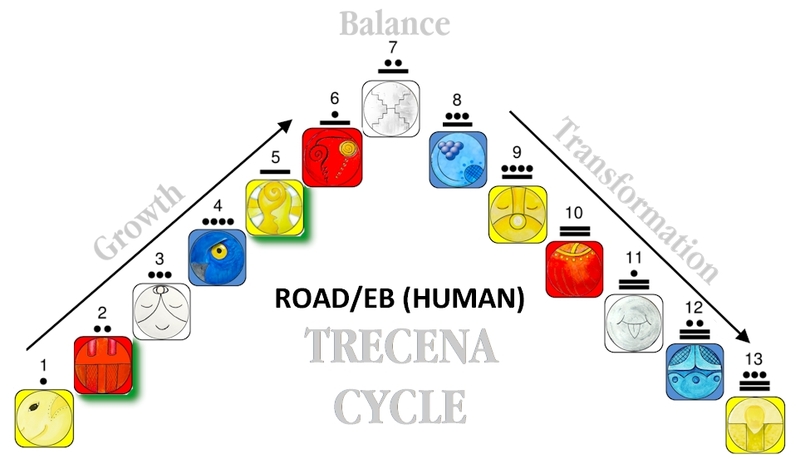 A Trecena of Light… As a Blue Day Sign, the Monkey signals a cycle of “Light.” Alternating cycles of “Light” and “Dark” represent times of Incoming Inspiration (Light), and times for application/work (Dark). The challenges we’ve carried through the Flint/ETZNAB trecena should now give way to a cycle that will Lift our Spirits through Divine Inspiration that will help us remember again, the Closeness of the Creator. Representing the direction of the West, the Monkey transforms our daily experience in a way that touches our Heart. To all my relations, may we observe the next 21 days as a timeout from worrying about our world. May we free ourselves from the sense of urgency, so we can learn from the Monkey how to cherish every moment. Living in the Now, our “axis mundi” of Time, is the place where we are empowered to spin the story of a life we dream about. Over the next 20 days, we will greet every Day Sign on our way to the New Year. May we acknowledge each one in a special way that would express our Gratitude and Appreciation for the Good Orderly Direction and Guidance they offer for the Transformation of Human Consciousness. It would be wonderful if you would give credit to the deceased Raven Hail, whom you directly quote and take material from her book, Cherokee Sacred Calendar, Cherokee Astrology, Animal Medicine in the Stars.